Forget hot city sightseeing, queuing for museums, and Everest Base camp before breakfast, holidays in 2011 are all about good old-fashioned relaxation. We’ve found that now, more than ever, people just want to chill out and slow down on their holidays. It’s all about taking in the view rather than climbing a mountain, lying back with a good book over dashing around art galleries, and time by the pool instead of hours spent on guided tours. In response to this trend, we’ve come up with our ‘Chill-Out Collection’ – a selection of the best places around the globe to sip a cocktail, watch the sun set, and do absolutely nothing. 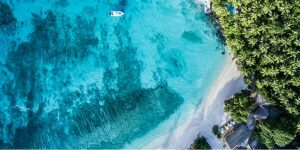 The collection offers a range of options, from remote places where you can escape the modern world and its demanding technologies, to luxury boltholes that meet your every need so you won’t have to lift a finger while you’re there. 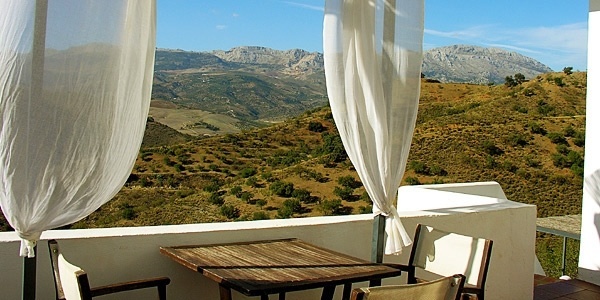 The Chill-Out Factor: If utter peace, privacy and intimacy, coupled with superb food and wine, is your idea of chilling out then this mountain retreat is definitely the one for you. With just 4 totally private suites, each with their own plunge pool and terrace, this place feels wonderfully quiet and decadent. Take in the soaring views, indulge in the fantastic food, chill out in the Zen garden and sleep in the wonderfully flamboyant bedrooms. Come here to unwind, to recharge your inner batteries and, above all, to rediscover the sheer pleasure of feeling so removed from the commonplace. The Chill-Out Factor: Arrive at this beautiful country retreat and you’ll find little incentive to ever leave! This place mixes medieval grandeur with contemporary chic and is located in quiet isolation just outside a small village. 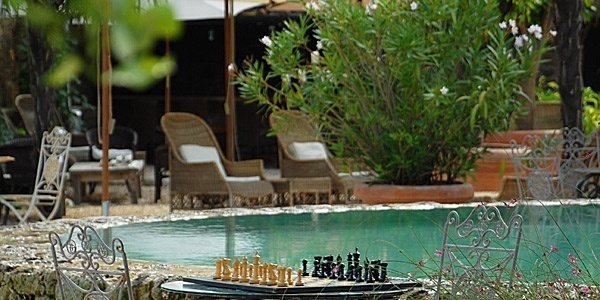 Everything is tailored towards complete relaxation and romance, with iPods, antique beds, a well-stocked wine cellar, an infinity pool and an outdoor cocktail bar. The extraordinary food is a highlight of a stay at Borgo San Pietro – enjoy relaxed breakfasts on the terrace and long evening meals in the candlelit dining room. The Chill-Out Factor: This remote retreat on Odysseus’ mythical island of Ithaca is the perfect place to recharge the batteries. It offers 4 rustic cottages, sweeping sea views, a cliffside infinity pool and an overwhelming sense of escapism! Wander through the terraced gardens perfumed with sage, rosemary and thyme, tuck into seasonal organic goodies plucked straight from the garden and drift off with an alfresco aromatherapy massage in a shady glade. You can self-cater, or to really chill out organise for meals to be delivered to your cottage. 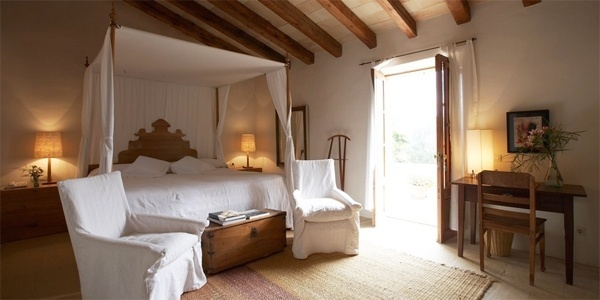 The Chill-Out Factor: This charming and chic finca and spa is all about calm, space, and natural serenity. Set in peaceful organic gardens, this place feels a million miles away from the worries and strife of everyday life. 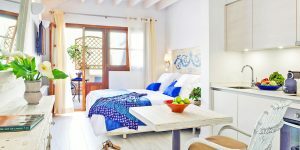 Take in the views over olive groves to the distant sea, listen to the tinkling of goat bells, tuck into delicious organic food and chill out in the wonderfully romantic bedrooms. 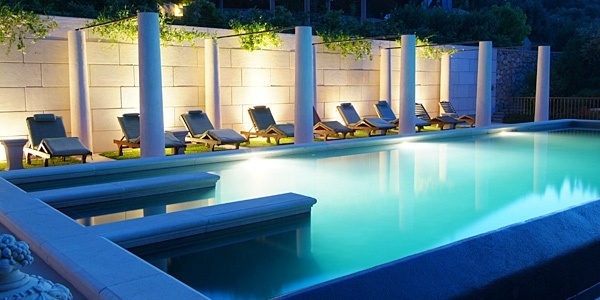 To help you really unwind, the hotel offers a jacuzzi, massages, a sauna, a steam room and indoor and outdoor pools. Looking ahead to Autumn and Winter, why not consider the following chill-out locations around the globe? Where? 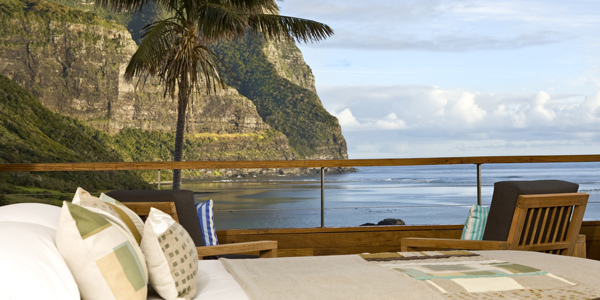 A beautiful lodge on a remote Pacific island off the coast of Australia – a 2-hour flight from Sydney or Brisbane. The Chill-Out Factor: The spectacular setting, super-calm atmosphere and empty beaches. And it’s half board, so you don’t need to stress about cost once you’re there. Where? 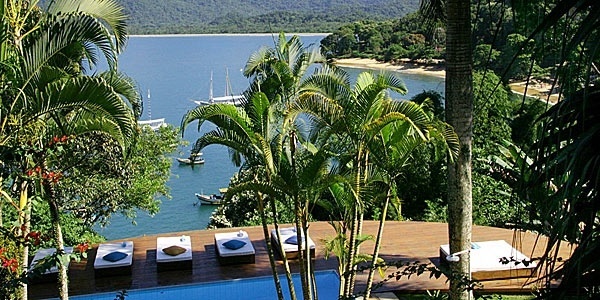 An exceptional hideaway on the edge of unspoilt Atlantic rainforest, located in the tiny fishing village of Picinguaba, which is halfway between Rio and Sao Paolo. The Chill-Out Factor: No TVs, no internet and no mobile phone connections – real escapism. It’s all about the fabulous views and unspoilt surroundings. Where? 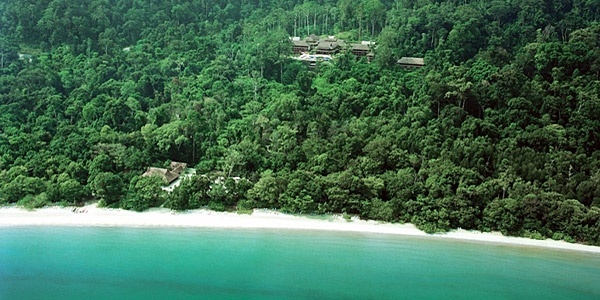 A stylish 5-star resort sandwiched between a private white-sand beach and 750 hectares of virgin rainforest, on a quiet, almost traffic-free island off the north western coast of Peninsular Malaysia. The Chill-Out Factor: This place caters to your every need and is all about being pampered. Enjoy luxurious rooms, an open-air spa, private beach, a choice of eateries on site and an 18-hole golf course.